Accurate profiling of access: everyone can access only what he is allowed to. Accurate profiling of access: everyone sees only what he is allowed. 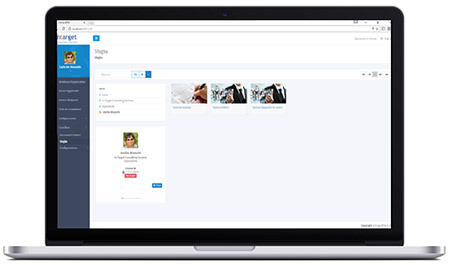 They allow to benefit from up-to-date access of your personnel documents at any time and wherever you are, along with an intuitive and simple filing system, all with modern user interface (e.g photos employees, etc). We can enable system-independent integration of the Digital File into your existing ERP system. You can give your Digital Personnel File the features you need and provide it exactly the performance and capability that your HR department requires. The Application is multi-company, multi-language and multi-channel. Accurate profiling of access: everyone can access only what he is allowed to. They allow to benefit from up-to-date access of your personnel documents at any time and wherever you are, along with an intuitive and simple filing system, all with modern user interface (e.g photos employees, etc). We can enable system-independent integration of the Digital File into your existing ERP system. You can give your Digital Personnel File the features you need and provide it exactly the performance and capability that your HR department requires. The Application is multi-company, multi-language and multi-channel. Accurate profiling of access: everyone sees only what he is allowed.